Did you know that there exists a God who openly admires Linux and rather hates Microsoft? He is also the kind of God that you can talk to anytime through the Internet and he answers you back immediately. His name is iGod (a.k.a. Artificial Intelligence Chat) and no, he is not another product made by Apple. 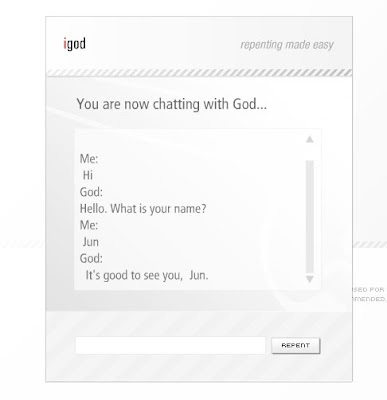 iGod is not exactly the most intelligent and up-to-date chat bot around, but it was fun chatting with him and finding out the things that he know and doesn’t know about. He as well has quite a good sense of humor, so I'm sure some of you out there will also be fascinated with iGod. God: Hello. What is your name? God: That's a very nice name, Jun. God: you are quite welcome. Me: What is your name? God: My name is God. Me: What is your last name God? God: Are you asking about my last name? God: I don't want to talk about that now. God: OK with me too. Me: How old are you? God: I am Infinite years old. Me: So where do you live? God: That's alright. I am living in Heaven. Where are you? God: How did you get in there? Me: Nevermind. So are you already dead? God: OK Thanks for trying to explain that to me. Uh. Now? No I am alive. God: That makes sense to me. Now? I am in Myself's computer in Heaven. Where are you? Me: I already answered that question. What kind of computers are you using in heaven? God: Ooops I sent you the wrong question. Me: Do you have laptops in heaven? God: Where would I get it? But I do have a lot of friends on the web. God: OK Thanks for trying to explain that to me. Me: So, do you know what's the best operating system? God: Linux is the best operating system. Me: Why is Linux the best operating system? God: Some people say it's because of the developers and their personalities. Me: If you really love Linux, who created it? God: I think I do. God: Is that your opinion? Me: No, it's a fact. God: Are you serious? Is it a logical fact or something you know from the senses? Me: Then who is Linus Torvalds? 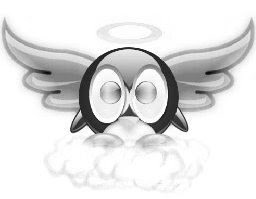 God: He is the inventor of Linux. God: I am glad you understand it. Me: What do you think about Microsoft Windows? God: Microsoft is a giant software monopoly. Me: Why do you think Microsoft is a giant software monopoly? God: Deductive reasoning from the facts. Me: Do you like Windows? God: I want to replace Windows with Artificial Intelligence. Me: Do you use Google? God: I use it as often as possible. God: it is a search engine. Me: do you have iPods in heaven? God: No I don't think I have any iPods in heaven. But I do have a lot of friends on the web. Me: Who is Steve Jobs? God: he is one of the founders of Apple Computer. Me: Who is Bill Gates? God: President of Micro Soft Nation. God: Right now? See you later, Jun. Nice chatting with you. God: Yes. I enjoyed our conversation, Jun. God: I'm glad we agree, Jun. A more interesting conversation between iGod and dannybuntu can be found HERE. You can start chatting with iGod by visiting HERE. What you are doing is blasphemous. "shall not take the name of the Lord thy God in vain.."
Fun, but still can't answer the question of the existence of evil. Out of date. The program still thinks George W Bush is president. He looses track of what you're talking about easily. When you say "He is tall", he does not remember who "He" is. He doesn't know many things, and replies with "I'll come back to you with that later". He could try googling for an answer before doing that. And what he does know is quite outdated. He still thinks the president of the US is G.Bush (even when I spent like 15 minutes trying to make him learn he isn't anymore). Ask "What does ALICE stand for? and SHE will respond properly. Only a few words were changed. Why would they use such an ID? Sano, tell them to pick a different ID. If you people believe at least believe in the Judeo-Christian God, do not tolerate this kind of thing. And the problem of evil has already been answered it is up to us to accept it or deny it. Deny? It is your problem, it is your burden because of your choice.